DESCRIPTION: The K6 is a standardised design made of cast iron, painted red overall with long horizontal glazing in door and sides and with the crowns situated on the top panels being applied not perforated. There are rectangular white display signs, reading TELEPHONE beneath the shallow-curved roof. It has modernised internal equipment. The kiosk in intact and appears to be in good condition (2009). This kiosk stands in a highly prominent location in the historic centre of Windsor, surrounded by listed buildings. It is situated at the confluence of four roads, directly in front of 55 High Street (Grade II). On the opposite side of the street, approximately 25m to the west, stand 1, 2 and 3 High Street (all Grade II). To the south, at a distance of approximately 35m, stand 12-16 Park Street, listed at Grade II*. 25m to the north east of the kiosk is situated the south west gate and lodge to St Alban's Street (Grade II). The kiosk has a strong visual relationship with this group of buildings collectively and can be seen simultaneously with at least two of them when viewed from any direction. 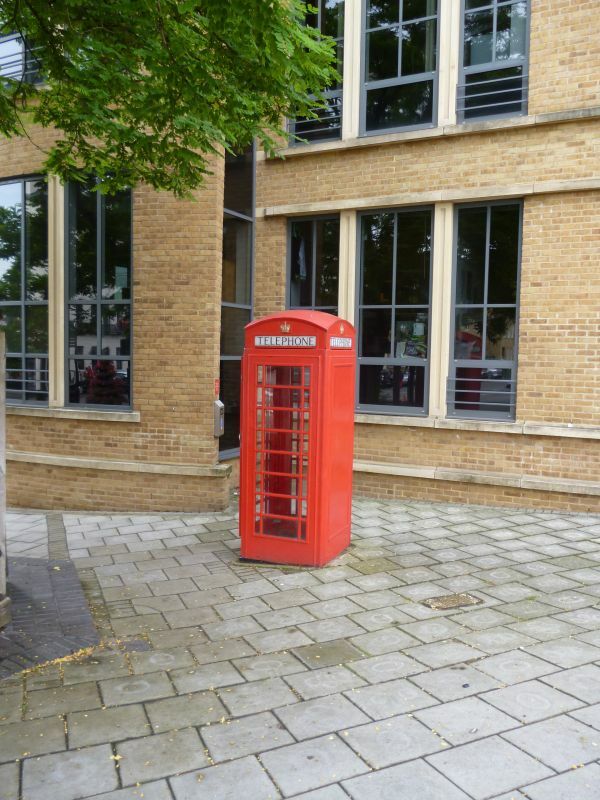 HISTORY: The K6 telephone kiosk is a milestone of C20 industrial design. The K6 was designed by Giles Gilbert Scott in 1935 for the General Post Office, on the occasion of King George V's Silver Jubilee. The K6 was a development from his earlier highly successful K2 telephone kiosk design of 1924, of Neo-classical inspiration. The K6 was more streamlined aesthetically, more compact and more cost-effective to mass produce. Giles Gilbert Scott (1880-1960) was one of the most important of modern British architects; his many celebrated commissions include the Anglican cathedral of Liverpool and Battersea power station. The K2 and K6 telephone kiosks can be said to represent a very thoughtful adaptation of architectural tradition to contemporary technological requirements. Well over 70,000 K6s were eventually produced. In the 1960s many were replaced with far plainer kiosk types. But many still remain, and continue to be an iconic feature on Britain's streetscapes.